Tidal overflow steams in the evening light. The five principal forces acting on sea ice are described below, in order of their general importance. Wind is the primary force responsible for ice motion, particularly at the timescale of days or weeks. 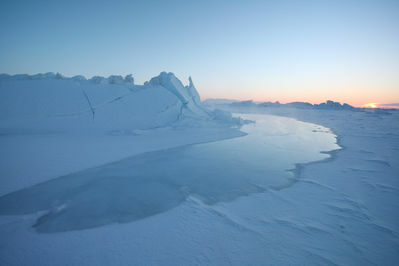 The wind blowing on the top surface of the sea ice results in a drag force on the ice surface and causes the ice to drift. The amount of the force depends on the speed of the wind and the characteristics of the sea ice surface. A rough ice surface is affected more by the wind than a smooth surface. The relationship between wind and sea ice drift is so strong that a general guideline can be applied: sea ice that drifts freely moves at 2 percent of the wind speed. The directionality of free drift depends on the size of the sea ice moving; larger pieces of sea ice move at the higher range of 20 to 40 degrees to the right (Northern Hemisphere) or left (Southern Hemisphere) of the wind direction. Other factors can also contribute to sea ice free drift, but this simple relationship explains up to 70 percent of sea ice motion on a daily to weekly basis. An ocean current force typically acts in the opposite direction of the wind force and acts as a drag on the wind-driven sea ice motion. Currents are an important factor in longer-term (monthly to yearly) ice motion. In some instances and regions, currents are important even over short periods of time. The Coriolis force causes objects to accelerate because of the rotation of the earth. The Coriolis force is small at scales of tens to hundreds of kilometers, but it does affect processes that occur at the global scale, such as ocean currents, winds, and ice motion. In the Northern Hemisphere, the Coriolis force causes objects to deflect to the right, and in the Southern Hemisphere, objects deflect to the left. The Coriolis force barely exists at the equator, and because the force increases toward the poles, it plays an important role in determining sea ice motion. Internal ice stress is a measure of the compactness, or strength, of the ice. Among the five forces affecting ice motion discussed here, internal ice stress is the most variable. Like the ocean current force, internal ice stress usually acts as a resistance to the motion caused by the wind force. Under circumstances when the sea ice pack is loosely compacted and can flow freely (for example, during summer), the internal ice stress is minimal. When the ice is compact and cannot flow, the internal ice stress can be high. For example, where there is a strong onshore wind, we might expect ice motion to be significant; however, if the strong wind is pushing thick, compact ice toward a shore, there may be little or no motion at all, because the ice has nowhere to go. Internal ice stress also plays an important role in the deformation of the ice and in the formation of some features, such as ridges and leads. Sea ice is relatively susceptible to tension forces. So, when the ice is "pulled apart" (picture a tug-of-war game) by winds or currents from opposite directions, the ice easily fractures and forms leads. Sea ice is much stronger under compression forces. When ice is pushed together by converging winds or currents, the internal ice stress keeps the ice from moving together, but if the ice is pushed together hard enough, the ice will "fail," or break apart, and pile up into ridges. This is similar to putting a thin piece of wood in a vise: if the vise is tightened enough, the wood fails and shatters into splinters. The strength of ice depends primarily on its thickness. Thin ice breaks apart easily under compression, while thick ice is much stronger. The failure of sea ice and the formation of ridges can create piles of sea ice many meters thick--much thicker than the thermodynamic equilibrium thickness. Thickness is one reason that thermodynamics alone does not determine ice thickness. Internal ice stress also depends on brine content, temperature, density, and other factors. Because internal stress varies so much, it is difficult to accurately estimate ice motion without it, particularly in constrained or enclosed areas of ocean. Furthermore, perhaps due to its great variability, internal ice stress remains the least understood sea ice force and continues to be a subject of considerable research. Despite how it looks, the ocean surface is not perfectly flat. Even if the ocean were completely at rest, it would consist of high and low regions caused by small differences in gravity; this undulating surface is called a geoid. However, because the ocean is never completely at rest, the ocean surface is higher than the geoid in some regions and lower in other regions. Several factors contribute to differences in the ocean surface level, including uneven heating, salinity variations, and currents, especially near coastal regions or ice shelves. Differences in surface level result in sea-surface tilt, a force that influences the ice motion. This force is quite small compared to wind and current forces and is not important over periods of several days. However, over longer periods of months or years, sea-surface tilt can have a noticeable effect on sea-ice motion.